What struck me though was the overcast weather – not particularly good for vultures to be flying and find a carcass. So I wondered how long it would take for them and the hyenas to get there. 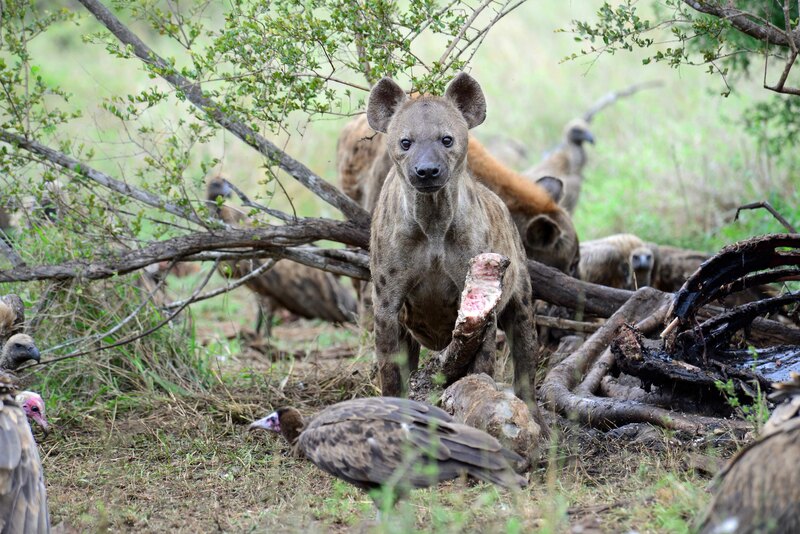 I was fortunate to visit the carcass numerous times over the next few days. As the carcass diminished and resembled a giraffe less and less, it struck me how often as guides we tend to only deal in the moment. Make no mistake this is critical for making the sighting come alive for our guests, but when the opportunity of a large kill presents itself, it is the big picture of being able to revisit the kill site over and over again that is so good. If the guests are not involved in the big picture and drawn into why this would be such a good idea, then they can easily feel like you are simply hauling them back to the easiest sighting and not making much effort. On the other hand, if you can bring the big picture to life of how long it may take for each of the various players in this scene to come and go until only the trox beetles remain, you will have done well. I would visit at different times of the day, use different lenses to capture the scene, park in different spaces and appeal to the guests’ patience in the hope that they will not just witness the scene, but really feel like they have lived it.